I am a big Uni-Ball fan, but it seems that all of my favorites are imported from Japan, and are of the micro-tip variety. I recently met the Senior Product Manager for Uni-Ball USA on Twitter, and he sent this Uni-Ball Vision RT my way to try out - and maybe change my mind? Right out of the gate, the design of this pen makes you take notice. The grip area is a comfortable rubber that morphs into accents for the rest of the barrel. Very nicely done. I also like that this pen is retractable, and in two ways at that: the standard button on the end of the barrel, and a safety net under the clip that if you slide into your pocket with the tip extended will retract the tip automatically. Looks are great, but how does it perform? Not bad, especially for someone who prefers finer lines like myself. 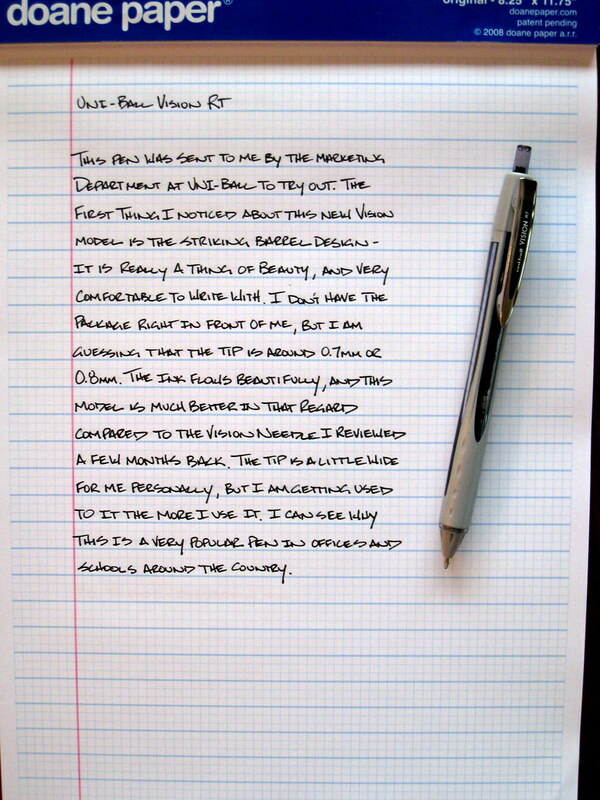 The bold line (0.8mm) is very solid, very smooth, and very dark - all things I like in a pen. Despite the width of the line, it doesn't bleed or feather on this Doane Paper, but I do need to try it on a few others to see how it does. Uni-Ball’s most technologically advanced rollerball pen. The Vision RT is hassle-free, leak-free and cap-free. The Vision RT is the world’s first retractable liquid ink pen to feature “Airplane safe” technology, that helps to avoid those embarrassing ink leaks in shirt or suit pockets due to changes in cabin pressure. Big thanks to Steve at Uni-Ball USA for providing this pen for review. You can find him on Twitter as UniBall_USA, so be sure to follow! Posted on December 22, 2008 by Brad Dowdy.